A South Florida jury has convicted Janepsy Carballo of first-degree murder for killing her husband’s business partner. The jury’s verdict came after almost three days of deliberations. Carballo, 37, was on trial for the 2008 killing of Ilam Nissim. The jury initially told the judge Wednesday that it was stuck on an 11-1 vote for conviction on a first-degree murder charge, before going back for more deliberations. Carballo claimed self-defense, saying Nissim had murdered her husband a month before and was coming for her when she shot him six times. “When he was trying to hurt her, when she was backing up to the drawer; she knew she had the defensive weapon to shoot him with, to stop him, as he’s reaching out to her, as he’s trying to grab her,” said defense attorney Nathan Diamond. 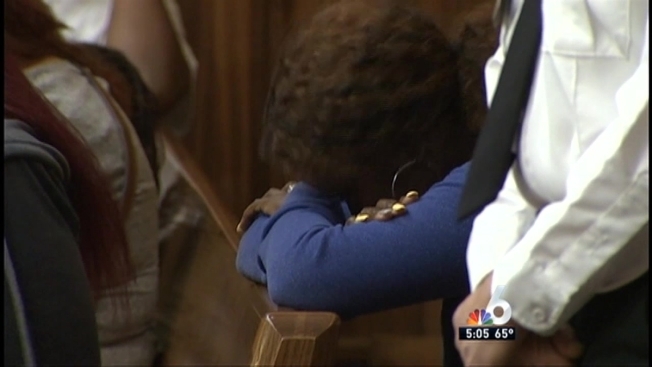 NBC 6's Claudia DoCampo has the details as a jury deliberates the fate of Janepsy Carballo. During closings, Carballo's attorney said she was suffering from post-traumatic stress disorder at the time of the shooting, saying she was scared of Nissim. Husband Orlando Mesa and the couple's son were shot outside their home on April 20, 2008. Mesa was killed and the young boy was injured but survived. Mesa's murder was never solved. “Revenge is first-degree murder, no matter which way you slice it, no matter which way you dice it, revenge is first-degree murder,” prosecutor Abbe Rifkin said. Carballo faces up to life in prison for the conviction on the first-degree murder charge.